Accepted Scientific Name: Agave univittata Haw. Origin and Habitat: Mexico (Plateau near El Paso) Texas. Agave lophantha f. quadricolor hort. 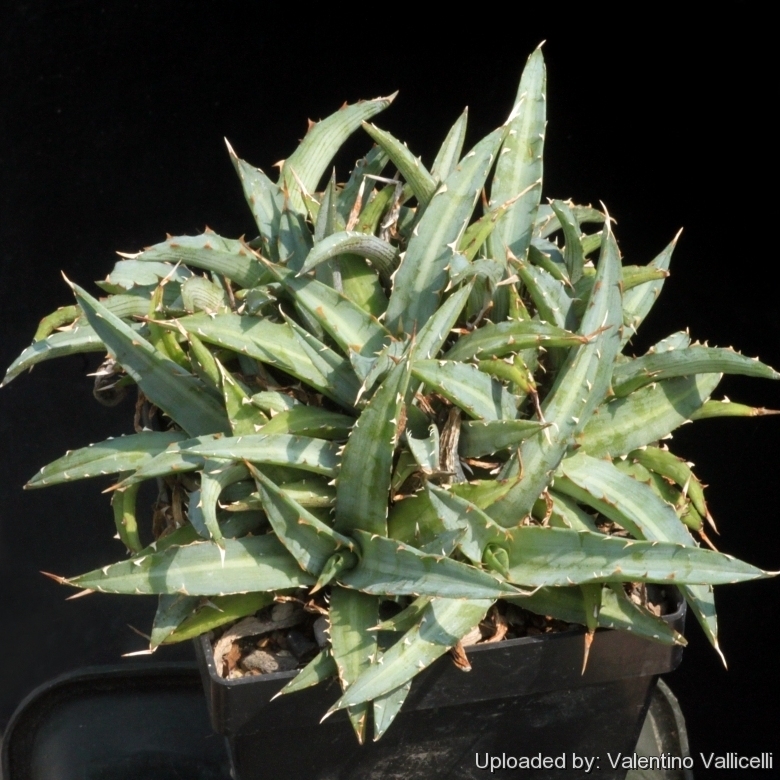 Description: Agave lophantha poselgeri is a small growing species not more than 30-40 cm tall and 50-60 cm in diameter (but often less) and recognizable for the open, loose, rather than erect rosettes typical of the related Agave lechugulla and Agave lophantha. It has a free suckering habit and occurs in a variety of forms, some specimen produces only a few large rosettes while some very prolific ones grows into dense cushion with dozen or even hundreds of small, crowded, offsets. Younger specimen are easily misidentified with Agave funkiana which has pale-brown spination, always reddish in Agave lophantha poselgeri. Leaves: Only 20-26 cm long, 16-18 mm wide, linear, lanceolate, flattish, ondulated, snake-like, often falcately spreading, convex below concave above, glaucous green with a lighter band in the middle portion of the upper face and with characteristic dark broken strips on the underside. The margins are marked by a thin continuous reddish border armed with remotely spaced, down-slanted small, teeth of the same colour which are weak and friable, absent in the upper part. Terminal spine long, fine conical to subulate, very sharp, large. Agave lophantha var. pallida A.Berger: rosette 25—30-leaved, 50 to 55 cm in diameter. Leaves to 50 cm long, and 25 mm wide, pale green, darker towards the margins, margins with narrow, detaching horny lines, spines hooked, 2.5-5 cm apart, 8-10 mm long. Agave lophantha var. poselgeri (Salm-Dyck) A.Berger: has a free suckering habit and occurs in a variety of forms. Leaves only 20-26 cm long, 16—18 mm wide, sinuous, with a long, fine terminal spine, spines small, distant, absent in the upper part. Distribution: Mexico: Plateau near El Paso; Texas. Agave univittata var. angustifolia (A.Berger) H.Jacobsen: (Variegated form) Leaves not numerous, 75 cm long, 2.5 c. wide, terminal spine slender, leaf dark green on the upper side, more grey-green on the reverse, with numerous darker cross-lines, marginal spines small, 2—7 cm distant. Agave univittata var. brevifolia (Jacobi) H.Jacobsen: Leaves 32—33 cm long, 5 cm wide at the base, 3.5 cm wide above the centre, gradually tapering towards the tip, ending in a blunt tip, leaf colour without green longitudinal lines. Agave univittata var. coerulescens (Salm-Dyck) H.Jacobsen: Similar to the species; Leaves somewhat shorter and more numerous, rough, light blue-grey, without pale band, spines rather stout, directed downward. Agave univittata var. gracilior (Jacobi) H.Jacobsen: Rosette very regular. Leaves more numerous, slender, more narrow, leaf margins more light grey, spines much closer and with browned tip. Agave univittata var. latifolia (A.Berger) Breitung: has larger, very dense-leaved rosettes 130—150 cm in diameter, 75—100 cm high, forming offsets. Leaves sword-shaped, 73-76 cm long, below 5.5 cm, at the centre 6 cm wide. Agave univittata var. lophantha (Schiede ex Kunth) Maire & Weiller: Same as Agave univittata, and the two plants are not readily distinguishable. Agave univittata var. lophantha f. quadricolor: Solitary or slowly clumping succulent rosette, up to 40 cm tall, 60 cm in diameter. Leaves variegated with four distinct colours. Agave univittata var. subcanescens (Jacobi) H.Jacobsen: Leaf margins and marginal spines almost white, leaf colour grey-green. Agave univittata var. tamaulipasana (A.Berger): Leaves 30-40 cm long, 25—35 mm wide, terminal spine conical, margins with a fine horny edge, marginal spines 15-20 mm apart, 3—7 mm. Distribution: Mexico, Taumalipas. 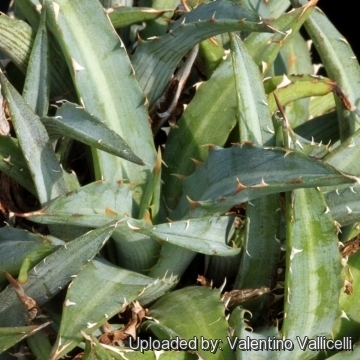 Notes: This species belongs to the tribe Marginatae with Agave lophantha, Agave lechuguilla, Agave victoriae-reginae, Agave kerchovei, Agave horrida, Agave funkiana, Agave titanota, etc. Cultivation and Propagation: It is a relatively easy-to-grow species. Suited for light shade to full sun, but better with some shade in summer. it needs a very well-drained soil and grows fairly fast in summer if provided with copious water, but allow to dry thoroughly before watering again (the more water and fertilizer this plant gets, the faster it will grow). During the winter months, one should only water enough to keep the leaves from shriveling. It has been reported to be frost tolerant down to -12° C, but it is best to avoid freezing temperatures if not perfectly dry. It does great in containers or in the ground. Plants cultivated outdoors are more drought tolerant and can take some heat and full sun. Propagation: It is usually propagated clonally from offsets, which often are found growing around the base of the plant. Remove the basal suckers in spring or summer and let the cuttings dry for a few days before inserting into compost.